Phototherapy is a treatment made with the help of a device that emits ultraviolet rays and is indicated for those who have chronic dermatoses, such as psoriasis and vitiligo. According to some dermatologists, it may also be associated with other systemic medications, such as retinoid. 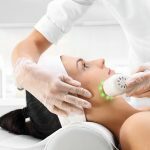 Also indicated for aesthetic purposes, this technique can be useful for combating wrinkles and blemishes on the skin, as well as promoting rejuvenation. The treatment is done with the help of devices specific to each area, such as light, led or laser cameras. The irradiation of the devices can be UVA or UVB, varying according to the wavelengths. The time of appliance also varies according to the type of skin. The treatment can only be done by professionals who have knowledge and expertise in this field. Phototherapy has anti-inflammatory and immunosuppressive action and is useful for decreasing the overproduction of cells at specific sites of the skin. Sometimes to potentiate the effects of this therapy, the doctor may prescribe the use of medicines such as retinoids, methotrexate or cyclosporin before exposure to light. During treatment, the person should remain with treated area exposed to light, protecting the eyes with a kind of slap eye that should be maintained throughout the treatment. Today professionals use Phototherapy, a light-intermediated treatment through the LED mask, which emits different colors for specific treatments, such as Blue, Yellow, Red, Green, Amber, and Purple, and may be associated with other procedures for its potentialization. This procedure is effective because the light has an immunomodulatory action under the skin, an anti-inflammatory effect, besides stimulating the production of melanin, which results in the treatment of numerous diseases. It is the color of energy, so it is recommended in cases of depression or sadness. Helps to improve circulatory problems, chronic fatigue, and joint stiffness. It’s the color of relaxation. It is perfect for the problems of anxiety and distress, and to combat discouragement. It is used for all types of injuries and nervous tensions. It is the color of peace and tranquility. It fights stress, insomnia, and fear. It is used to treat nasal congestion, body aches, and swelling. It is the color of the spirit, it returns the interest in things that one used to like. Facilitates harmony between mind, body, and spirit and can increase appetite. It helps to treat asthma, bronchitis and ligament rupture. It is the color of hope and can help make changes in ideas. It helps to have a good hormonal balance. It is the color of goals; dressing in yellow helps you achieve your goals. This light cleanses your body of toxins and menstrual discomfort for women. Three number sequences: what are they trying to tell you?